Jupiter is composed mainly of . The largest satellite in the solar system. It is thought to have a three-layer structure of a molten iron core, silicate mantle, and ice exterior. Primarily formed of silicate rock. The surface is dotted with active volcanoes, calderas, and other signs of geological activity. Jupiter's composition is most like that of . Venus is between Saturn and Jupiter. Which are names of rings of Jupiter? 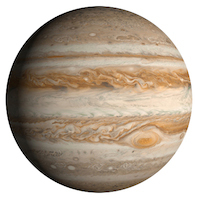 Is Jupiter a terrestrial or Jovian planet? Discovered in 1610 by Galileo. It is coated in a thin layer of ice, which causes it to be exceedingly smooth. The surface has a series of dark streaks that may be due to geysers or volcanic eruptions. Jupiter is named after a Roman God. Jupiter's Great Red Spot is a giant . Between what two planets is the asteroid belt located? Jupiter's banding is created by strong winds.